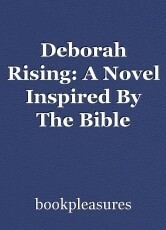 In his most recent novel, Deborah Rising: A Novel Inspired By The Bible Avraham Azrieli evokes the story of Deborah, a Hebrew prophet, ruler, judge and military leader who freed the Israelites from the oppression of the Canaanites. When we meet up with Deborah in the Book of Judges we really don't know much about her early childhood,who were her parents and how was she able to rise to such a high position in a world dominate by men. Azrieli in his Acknowledgements informs us that his inspiration for the novel was drawn from his visit to the archaeological remains of the ancient city of Shiloh which is located about twenty-five miles east of modern-day Tel Aviv. Apparently, after the conquest of Israel under Joshua, Shiloh became a religious centre and an Assembly-place for the tribes, and the Tabernacle of Moses was set up there (Josh 18:1). Our story begins in the town of Emmanuel when a thirteen year old Deborah, daughter of Harutz of Ephraim witnesses the horrendous stoning of her fourteen year old sister Tamar who had been falsely accused of not being a virgin when she married Seesya of Ephraim the eldest son of Zifron, the judge who rules Emmanuel. Seesya calls her a whore and according to priest Obadiah of Levi, the punishment is stoning until death. Unfortunately, Tamar's parents are deceased and no one was able to defend her with the exception of her deceitful husband. Tamar refuses to heed the call from Obadiah, who asks her to repent and who informs her that he is powerless to help her if she doesn't do as he commands. At the same time, he asks for her forgiveness. Tamar tells Obadiah that she will forgive him on condition that the ring given to her by Seesya, which she pulls off her finger, does not go on her sister's finger. He is to protect her from the suffering and the same injustice she has suffered. Unfortunately, Seesya grabs the ring from Obadiah and forces it on the finger of Deborah who now becomes betrothed to him. After the stoning, Deborah escapes to her abandoned family home where she encounters the blacksmith Abinoam and his son Barac. Abinoam tells her that she must return to Emmanuel. Defiant, Deborah replies that it is up to Yahweh and she goes on to recount how her father had replied when she asked him if he regretted she was born a girl and not a boy. His reply was “How could I regret it? Yahweh chose you to speak for Him to our people.” Deborah is confused and questions her father once again and wants to know how she a female could possibly speak for God, and to which he answers: “Why not? When you grow up, you'll become a prophet. Yahweh created the whole world. Don't you think He can create a prophet out of a girl?” Deborah was still not convinced that an ordinary girl like herself could become someone special as a prophet. During the course of her conversation with Abinoam, Deborah learns that there exists a mysterious Edomite known as the Elixirist who has the power to turn women into men. Upon returning to Emmanuel, after being captured by Seesya, Deborah encounters the slave, Sallan who helps her escape and search for the Elixirist in exchange for her promise to free him. She is told she must travel to Shiloh and pray to Yahweh at the Holy Tabernacle. From this point onward, we journey with Deborah in her dangerous pursuit in search of the Elixirist who has a magic potion that will change her into a man and enable her to reclaim her inheritance, plow her father's land and serve her God. Azrieli risks a great deal with this seductive saga but nonetheless achieves much with his magic that is peopled with a fascinating array of characters and even offers some sage commentary. He never condescends in sentimentalizing Deborah, who for all the tragedies she has endured, as well as bitterness and despair, continues to survive while never losing faith in God and her religious teachings. She learns that it requires more than just pretending to be a boy that will transform her but rather perseverance and focus or as she is counselled, “imitate until you mutate”. In addition, with its evocative snapshots Azrieli manages to vividly recreate the milieu of the story filled with biblical history, myths, fanaticism and sexism. One word of caution, some of the scenes are quite graphic and may not be for everyone's taste. I look forward to reading the sequel, if one is in the works? © Copyright 2019 bookpleasures. All rights reserved.